Wine already engages many of our senses – the smell of French oak, the tasting notes of a complex cabernet, the sound of a cork popping out of a bottle. Some vineyards are also creating a feast for the eyes with art galleries, sculpture gardens and photography collections to enjoy as you sip their wines. These wineries pair their delicious creations with art displays ranging from bold and grandiose to quiet and understated. 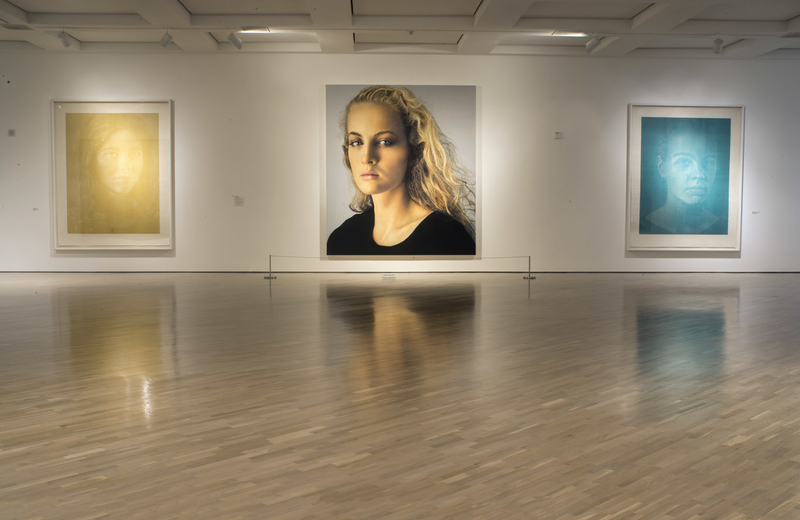 Here are 10 wineries with superb art collections you’ll want to visit. They take art seriously at Hall Wines — so seriously that you can see one of their most eye-catching pieces from Napa Valley’s Highway 29. It’s a sculpture called “Bunny Foo Foo,” designed by the late Denver artist Lawrence Argent. This 35-foot-tall, stainless steel rabbit appears to be leaping gracefully into the vineyard. There are more than a dozen other pieces at this St. Helena tasting room, including a giant, shimmering mounted sculpture made with beads and sequins called “Garden Plot” just inside the front door. If you’re a fan of bubbles, you’ve likely had a taste of some of Mumm Napa’s sparkling wines. After you enjoy their gorgeous southwest-facing patio, take a stroll through Mumm’s art collection, which is housed in the same building as their barrel room. Their collection changes regularly and has featured fine art photography by the likes of Ansel Adams, Wayne Levin, Ben Nixon, Jim Marshall and others. Belle Fiore Estate & Winery is all about supporting local artists in southern Oregon. The winery features pieces from a different local artist in its gallery spaces every month, and they don’t stop there. They’ve also established the Belle Arte competition, a contest that results in a local artist’s work being featured on the winery’s labels. The winning piece is permanently displayed in their gallery. 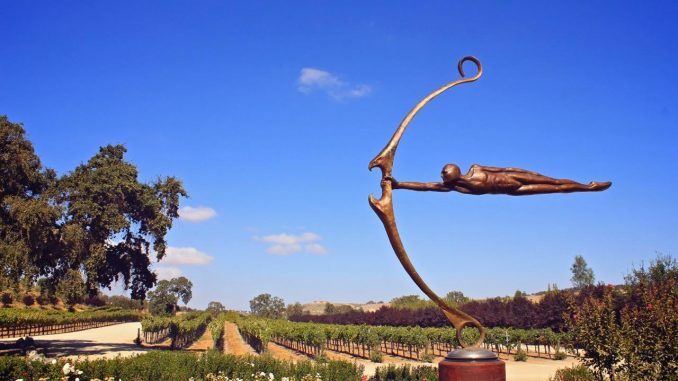 As the name suggests, this Paso Robles winery is also home to an incredible sculpture garden. Grab a glass of wine and stroll through their gorgeous collection, which features massive bronze and granite works from the late sculptor John Jagger, along with pieces from other artists. 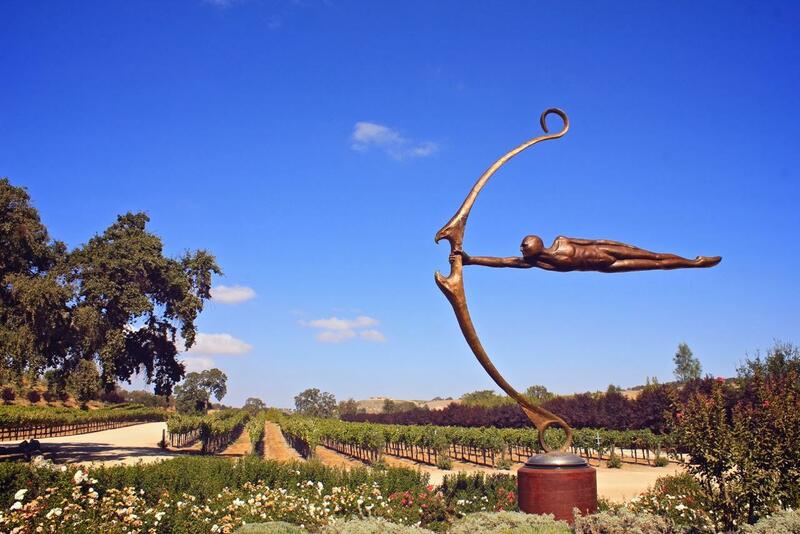 When Jagger died in 2013, the winery recruited local artist Dale Evers to become its next sculptor-in-residence. Evers creates shimmering stainless steel and glass pieces, including a 22-foot depiction of a dragonfly landing on a cattail. Not only is the drive up to Hess Winery gorgeous, but the vineyard has such a refined contemporary art collection that you’ll wonder if you walked into a museum instead of a tasting room. The winery’s founder Donald Hess started collecting art in 1966 and decided to showcase some of his personal collection on the upper floors of the Napa Valley building. There are docent-led tours of the collection every morning, or you can go at your own pace with a complimentary audio tour. There’s a four-acre grove with old oak trees, mossy rocks and grassy meadows that’s perfect for highlighting founder Walter Byck’s sculpture collection. 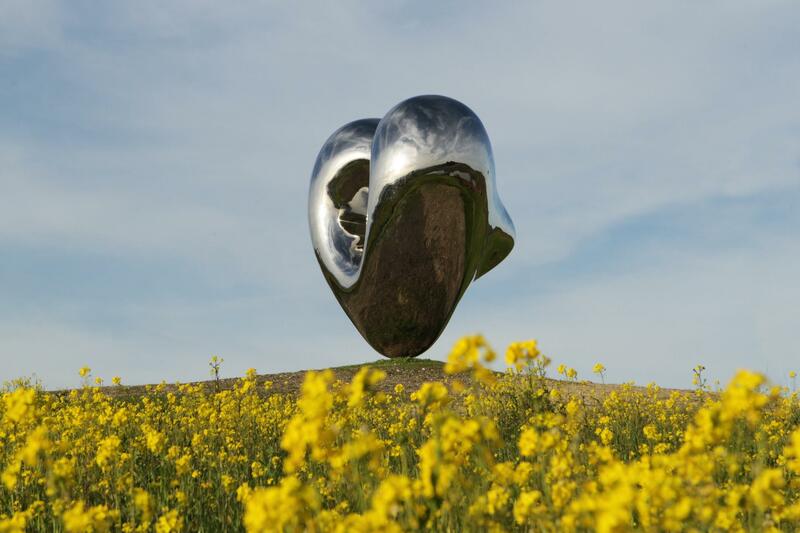 The most iconic piece features four giant letters that spell out the word “LOVE.” Unfortunately, Paradise Ridge was badly burned by the wildfires that struck Northern California in 2017, though luckily the sculptures were unharmed. The sculpture garden is closed to the public right now, but the winery is going to need all the help it can get during the rebuilding process, so plan to view their collection later or visit their Kenwood tasting room, which is currently open. With its comfortable couches, exposed rafters and homey decor, Turnbull Wine Cellars makes you feel like you’re tasting wine in your living room. Beyond that, they have a top-notch photography collection that has featured images by Lisa Kristine, Ansel Adams, Edward Weston and others. The gallery changes over twice a year, so there’s a reason to visit the Oakville tasting room more than once. When you visit Jessup Cellars, you can taste their wines at the bar or in their extensive art gallery, which features paintings, sculptures and other styles. This Yountville winery even has its own in-house curator and resident artist, Cynthia Carey, who specializes in mixed-media pieces. You’ll find works from both well-established artists and emerging talents at Jessup Cellars, which frequently hosts interactive events such as a summer music series and a film series. You might’ve guessed from the name of this Sonoma winery that its founders are art lovers. Imagery Estate Winery works with dozens of artists (as many as 35 at a time) to create unique pieces that appear on the labels of its wine bottles. 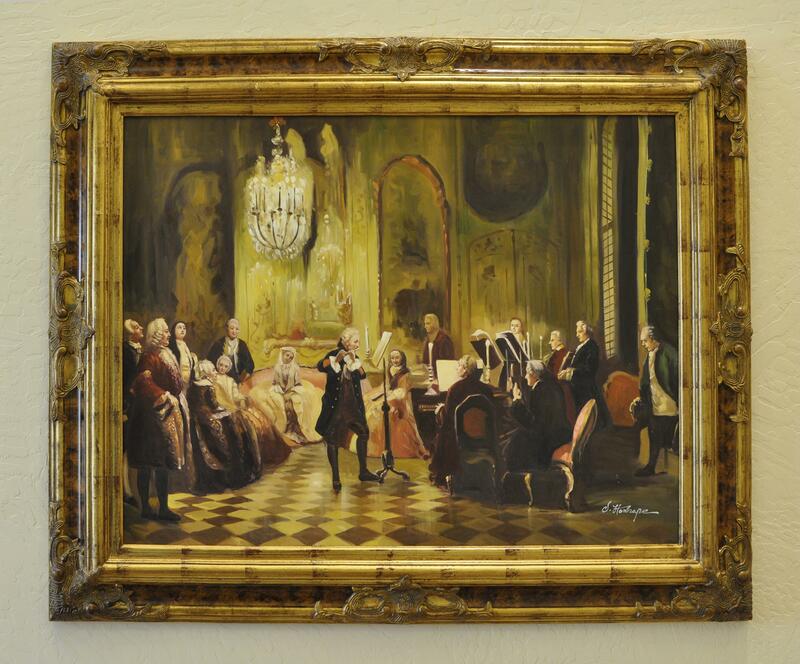 They also have an on-site gallery featuring more than 60 pieces at a time. 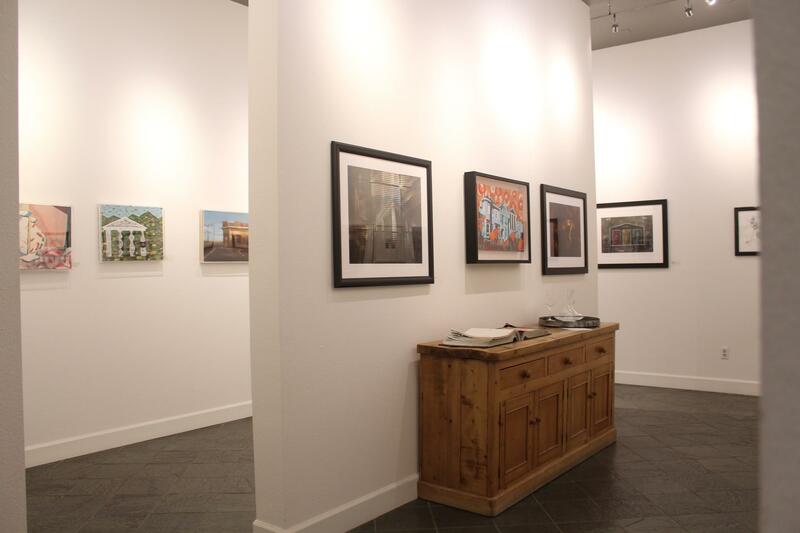 Their total artistic collection contains more than 500 pieces by 300 different contemporary artists, and Imagery offers “Gallery Days” where the label artist is on site to answer questions and sign bottles. About the author: Sarah Kuta is an award-winning Colorado writer and editor who regularly writes about travel, food, nature, education, personal finance and other topics. Her favorite wine is cabernet sauvignon and she visits Napa Valley at least once a year.